The sense of smell has to be the most undervalued of the senses, and yet smell carries such power and evocation. The smell of baking muffins can take you right back to your childhood; cheap perfume to your early teenage years! Smells can be nasty, of course, but also sheer pleasure - just conjure up crushed lavender, fresh coffee, sun-dried cotton … mmmm. Some brides are now determined that the main scent at their wedding won’t be their risqué uncle’s aftershave, and are burning essential oils at the reception, and ordering scented petals as confetti. Smells are just so sensual! It was one of the top reasons we selected soaps as favours. They not only look adorable, but are practical, and they smell simply heavenly - your guests will sniff appreciatively at the indulgence to come. After decades of shower gel and liquid hand wash reigning supreme, good quality soap is coming back into favour. It’s more eco-friendly; no wasteful plastic packaging. It allows you to have gorgeous china soap dishes, and it lathers so much more creamily and luxuriously than the liquid stuff! 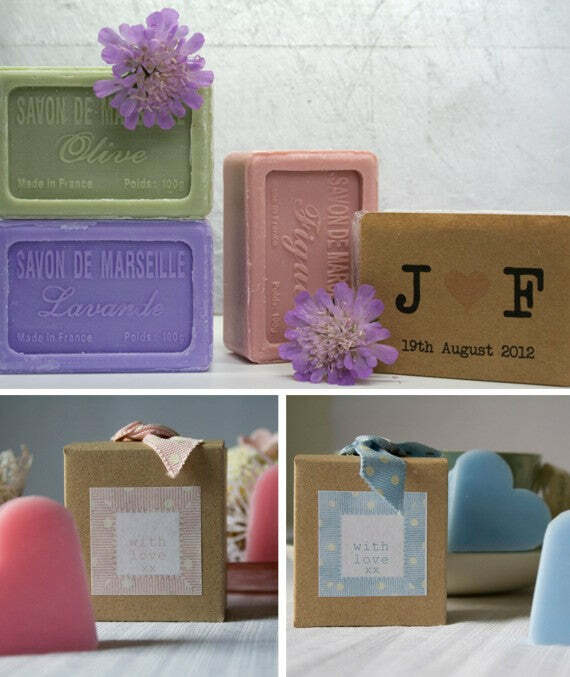 We can guarantee that these super soap favours won’t get left on the tables.